CANBERRA, 20 SEPTEMBER 2018 (THE AUSTRALIAN) – Australia is working on plans with Papua New Guinea to develop a joint naval base on Manus Island, edging out Chinese interest in the strategically vital port with a new facility that would be capable of hosting Australian and US ­warships. The Australian understands Malcolm Turnbull and PNG Prime Minister Peter O’Neill discussed the proposed defence partnership at a July 11 meeting in Brisbane ahead of this year’s third State of Origin match. O’Neill was said to be “very interested” in working with Australia to redevelop the Lombrum Naval Base as a joint ­facility, prompting a scoping mission by Australian defence officials. The PNG Prime Minister, who was briefed on the results of the scoping study, later wrote to Turnbull to formally express his support for the project. The Turnbull government had hoped to finalise arrangements for the investment before the Asia-Pacific Economic Co-operation meeting, to be hosted by PNG from November 12-18, which will be preceded by a special summit for ­Pacific leaders in Port Moresby hosted by China’s President Xi ­Jinping. 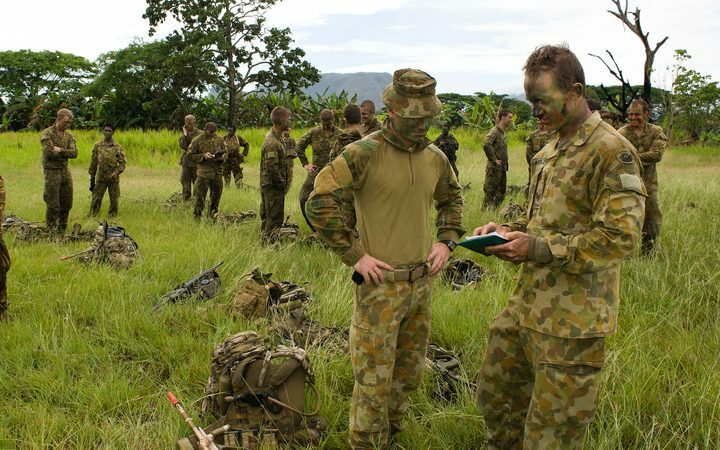 Australian officials have ­expressed concerns over Chinese interest in the redevelopment of four PNG ports, at Wewak, Kikori, Vanimo and Manus Island, fearing the Asian superpower is working towards gaining a military foothold in the region. The deepwater port at Manus is considered the most strategic­ally significant of the four because of its sweeping command of the ­Pacific Ocean and the maritime approaches from Asia. O’Neill and Solomon ­Islands Prime Minister Rick Houen­ipwela, who also attended the State of Origin match, signed a deal with Mr Turnbull on the same trip for Australia to fund a $136 million (US$98 million) internet cable ­between the three countries, ­preventing Chinese company ­Huawei from building the infrastructure. Plans for the joint facility were under way as Australia moved to block Chinese involvement in ­another regional military development — the upgrade of Fiji’s Black Rock military camp in Nadi. Turnbull led the negotiations with Fiji Prime Minister Frank Bainimarama to ensure Australia became the sole foreign donor in the redevelopment of the base, which will be used as a regional training hub for South Pacific ­defence forces. Foreign Affairs Minister Marise Payne declined to comment on the proposed joint facility but said Australia was in frequent contact with PNG officials regarding their development priorities. “Australia supports the PNG government’s ambitions for greater economic growth and development, including on Manus Island,” she said. The Lombrum Naval Base has long been the site of close co-­operation between Australia and the PNG Defence Force. Australia operated the base from 1950 until it was handed back to PNG at independence in 1975. Australia financed the construction of the current Lombrum wharf, and its refurbishment in the 1990s. More recently, the base was the site of Australia’s Manus ­Regional Processing Centre, which closed in October last year. Australian Strategic Policy Institute director Michael Shoebridge, a former Defence Depart­ment official, said using Manus as a base for PNG, Australian and US forces “makes good sense … It would help give the US a wider operating and support footprint in the Pacific, and give Australian naval forces a location 2000km away from Darwin and some 1600km north of Cairns — the two closest Royal Australian Navy bases”. He said the PNG Defence Force, which will receive three new Guardian-class patrol boats from Australia, would be a major beneficiary, gaining new facilities and a closer working relationship with Australian and US navies. If the investment were ready to announce by the APEC summit, it would “send a very welcome message about the deeper intent behind Australia’s commitment”, Shoebridge said. To ensure the economics of the facility, Australia would need to have naval ships using the facility “almost continually”, he said, while a US presence would add to its economic feasibility. The Lowy Institute’s Pacific Islands program director, Jona­than Pryke, said despite China’s growing influence in the region, Pacific leaders preferred to work with Australia than China. O’Neill, who enjoys close relations with China’s President, agreed on a recent trip to Beijing to allow Xi to host a summit for Pacific Island leaders ahead of the APEC leaders’ meeting. For Xi, the trip to Port Mores­by will be an official “guest of government” visit, with full red-carpet treatment. Scott Morrison, who was criticised by regional leaders for failing to attend this month’s Pacific Island Forum, will seek to counter the Chinese charm offensive by hosting an APEC barbecue for Pacific Island counterparts at the Australian high commissioner’s Port Moresby residence. In last year’s foreign affairs white paper, the government committed to “stepping up” its engagement in the Pacific, as China tries to win over ­regional leaders with foreign aid and soft loans for infrastructure projects under its Belt and Road Initiative. There has been a surge in Chinese investment in PNG ahead of the APEC summit, with major roads projects funded by China’s Eximbank and awarded to Chinese firms China Railway and China Harbour. Senator Payne signed a security declaration with regional leaders at the Pacific Island Forum that asserts the right of every member country “to conduct its national affairs free of external ­interference and ­coercion”. During the forum, she suggested that China, when it made contributions to ­Pacific nations, “should perhaps look at the benchmarks that we adopt … around strengthening security, strengthening stability, and strengthening prosperity”. “Countries will make their own sovereign decisions about arrangements they enter into … but the benchmark that Australia places on this is one of engagement and partnership,” she said. The PIF security declaration identified climate change as the biggest threat to the region. Days later, Morrison said Australia would remain a signatory to the Paris climate change agreement because the issue was “incredibly important” to Pacific nations. “In the Pacific, this issue dominates their thinking and agenda … the Pacific is one of the most strategic areas of influence in our world today,” he said.